I WAS saddened to read in the News & Mail of the passing of Reg Stratton. Reg was one of the finest footballers I have ever seen play for Woking Football Club. During what was a golden era for the team, Reg Stratton played for the Strollers, (third eleven), Reserves and first team all within eight days! Within a few months he was playing for England. On April 12th 1958 in front of a crowd of over 70,000 and with millions more watching live on BBC TV, Reg scored the second goal of three in the Amateur Cup Final held at Wembley when Woking defeated Ilford to lift the trophy for the first time. Reg was just 18. A highly skilled and truly fast left winger, he joined Woking straight from playing for his Aldershot school. Between 1956/8 at various times Reg was joined by Charlie Mortimore (probably the most popular and successful player ever to have booted up for the club), Charlie’s brother John, Geoff Hamm and Roy Littlejohn in playing for England. 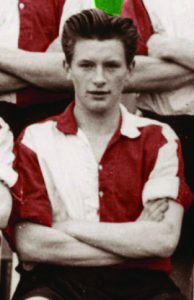 In the 57/58 season Reg was – along with Charlie – Woking’s joint top scorer with 27 goals. I can still see Reg tearing down the left wing placing a perfect pass for Charlie to score yet another goal.